"Popular Committees of Resistance" mulling "creative" ways of attracting media attention. Arab terrorist rioters have announced that they intend to target the Jewish community of Beit El, in the Binyamin region, and analysts say this is part of an effort to attract media attention to the rioters' violent activities. Abdullah Abu Rahma, a prominent member of the Popular Committees for Resistance to the Fence and Settlements told the PalToday website last Wednesday that a new campaign, named "Country – be Strong," involves the Popular Committees as well as Palestinian Authority youth movements. The campaign will center on Beit El, he said, because "it is a symbol of the settlements." A new report by the Intelligence and Terrorism Information Center says (ITIC) that leading members of the Committees have recently expressed a will to renew violent actions that include confrontations with the IDF and the settlers of Judea and Samaria. They promise to use "creative methods" to confront the IDF, and may choose to act Tuesday, because it is the anniversary of an anti-Israeli Hague International Court opinion on the separation barrier, which was given on July 9, 2004. Abu Rahma promised "special and surprising actions" in the coming days. The ITIC estimated that the Committees' activists feel that their routine rioting is not receiving enough media attention, especially since the dramatic events in Egypt are overshadowing them. 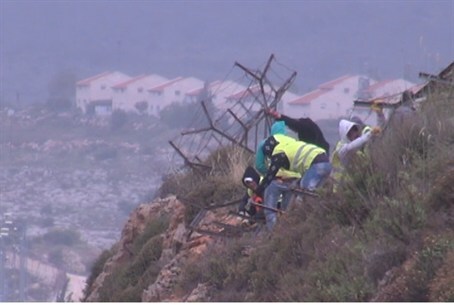 The Committees and similar groups organize violent actions against the IDF in various spots along the separation barrier that Israel built to prevent suicide bombers from entering its population centers from Judea and Samaria. They provoke IDF soldiers and videotape their reactions, in the hope that they will be able to catch them behaving violently.